After starting my cookbook challenge a year ago, I finally reached the last week. 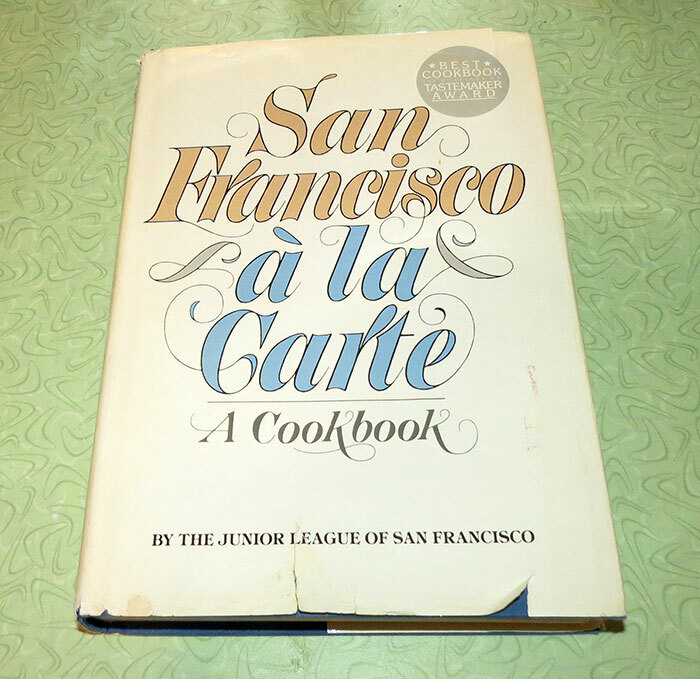 For Christmas, my sister gave me the cookbook "San Fransisco a la Carte" by the Junior League of San Fransisco, published in 1979. Although there are no food photos, each section of the book starts with a photo of a different site in San Fransisco. This cookbook is full of wonderful sounding recipes and at first glance, I could see a number of recipes that I want to try, but settled on the recipe for Korean barbequed short ribs. My grocery store didn't have short ribs, so the butcher suggested using chuck eye steak instead, as he told me this was basically the boneless version of short ribs. 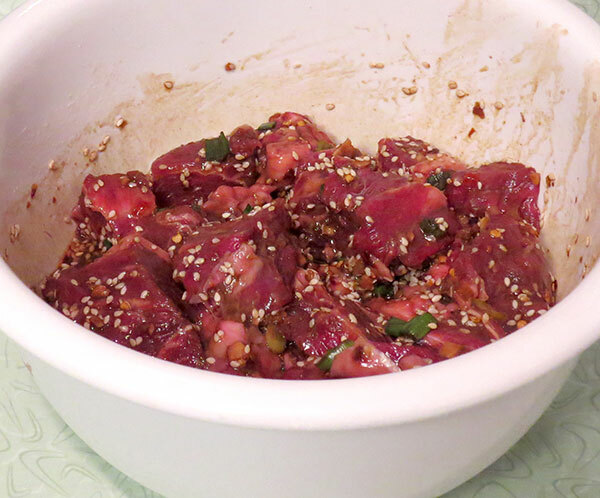 The first step was to make a marinade of soy sauce, apple cider vinegar, sesame oil, red pepper flakes, garlic, green onion, ginger and sesame seeds. I cut up the steak into strips and let them sit in the marinade for an hour. The recipe said to cook steak on the grill or bake in the oven until done. Since it was about 10 degrees outside, using the grill wasn't an option, but the recipe didn't give any specific instructions about temperature or cook time for the oven, so I turned to the internet. I discovered that you could simulate grilling by broiling the meat about 4 minutes on each side. The broiling method worked well except that it smoked a bit and set off all the smoke alarms throughout the house. After finally figuring out how to turn those off, we tried the steak and it was delicious. 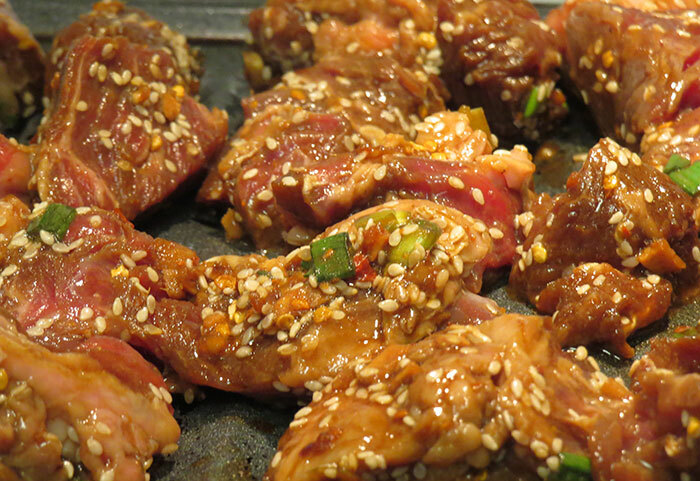 The marinade taste very similarly to teriyaki sauce and was a bit spicy and sweet. The cooking time of four minutes on each side made for very tender, medium steak. My only issue was the smokiness of the cooking process, so may try a different method next time. Because of the smoke alarm incident, I completely forgot to get good photos of the final steak, so here is a photo of the steak just out of the oven.